The word “crossbite” is one of the few dental terms that is almost self-explanatory. An individual with a crossbite will have teeth that are out of place when biting. One set of teeth will fall either inside or outside the opposing set when they are in contact; therefore, a crossed bite. The most common crossbite is one in which one or more of the upper teeth bite inside the lower teeth. Another type occurs when the upper teeth bite completely outside of the lower teeth. A third type of crossbite also exits which is a combination of the first two. There are many reasons that crossbites develop. For example, an upper primary tooth that is late in exfoliating [getting loose and coming out] can cause the permanent tooth to erupt inside or outside its correct position. Another example occurs when upper permanent teeth are very crowded. Because of this lack of space, one or more of the newly erupting teeth will have to go inside their correct position. This adverse position of the upper tooth/teeth will cause the bite to be inside the lower teeth. Conversely, if the lower teeth are crowded, one of them can erupt to the outside of its normal position locking its correctly positioned upper mate to the inside. Crossbites are responsible for many serious conditions. An example is a larger upper front tooth biting inside a smaller lower front tooth. This situation can cause a loss of support bone on the front of the lower tooth. If this condition remains untreated, the lower front tooth can lose enough of the support bone to necessitate its removal. Unfortunately, that can occur before all of the permanent teeth have erupted. Another problem can occur if the crossbite interferes with the proper positioning of the lower jaw on closing. Again, if not treated, temperamandibular joint and growth problems can arise. Other problems that can develop are uneven wear of the teeth, difficulty in chewing, uneven or reduced growth of one or both jaws, problems in getting the teeth clean because of the improper alignment and a self conscience smile. The younger a crossbite patient is treated, the more positive will be the results. 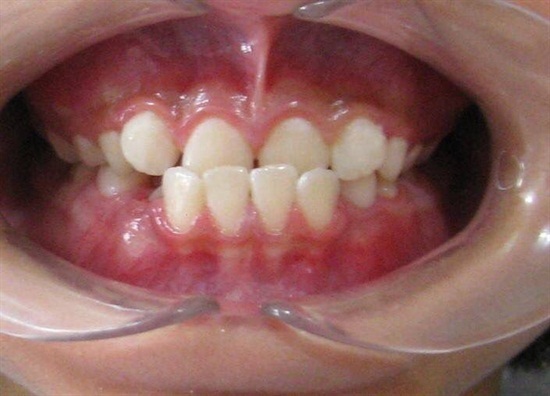 Treatment should be initiated even if the condition is noted when only the primary teeth are present. The ability of the jaws to grow and mature as nature intended is the best result a child can get. Patients with crossbites in their permanent teeth, teenager or adult, can also be successfully treated to an excellent outcome. However, the correction will be different for this type of patient than it would be for a younger one. Once we reach an age that growth has mostly or completely occurred, the orthodontist has limits to the types of treatment that can be used. That is why early treatment is recommended and encouraged. Another type of crossbite develops when the lower jaw hereditarily develops further forward than the upper jaw. When this happens, usually all of the lower teeth are forward of their normal position in relation to the upper teeth. The facial profile is concave and the lower front teeth usually all bite forward of the upper front teeth. When this growth pattern occurs, it is urgent that complete orthodontic records [models, head x-rays and photos] be secured as early as possible. Then our trained doctors can develop a long-range treatment plan to treat the particular patient. Early diagnosis and treatment can sometimes avoid surgery when growth is completed. Again, early treatment is best.